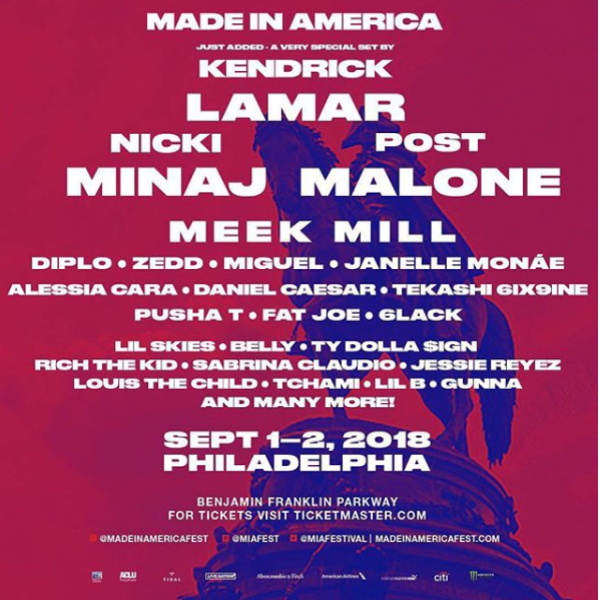 For the 7th year in a row, the Jay-Z curated Made in America festival is back, taking place over labor day weekend at Benjamin Franklin Parkway in Philadelphia. 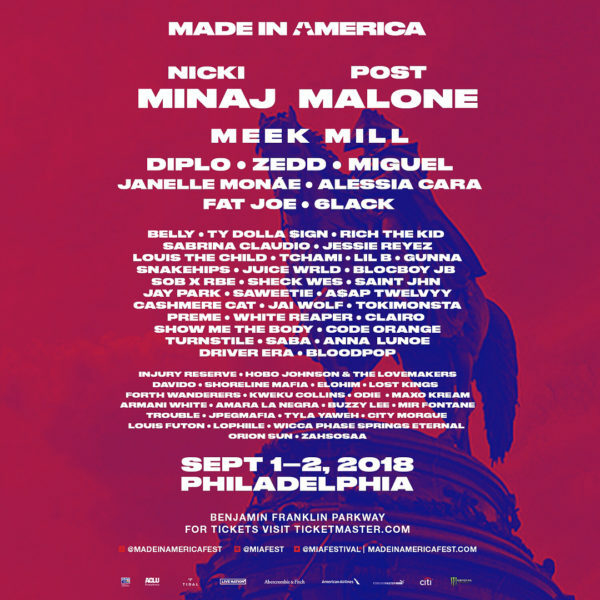 The main goal of the festival has always been to have a positive economic impact on the city of Philadelphia, with the event generating 31.9 million dollars for the city since its inception in 2012. Jay-Z’s Tidal music streaming platform will be live-streaming the event to a global audience. Once again the lineup features a bevvy of fast-rising and influential artists such as Post Malone, Nicki Minaj, Meek Mill, Diplo, Zedd, Miguel, Janelle Monáe, Alessia Cara, Fat Joe, 6lack, Belly, Ty Dolla $ign, Rich The Kid, Sabrina Claudio, Jessie Reyez, Louis The Child, Tchami, Lil B, and Code Orange among many others. In the span of a few years, Post Malone (Austin Richard Post) has gone from the underground to a bonafide superstar, with his latest release Beerbongs & Bentleys hitting number one on the Billboard 200. Drawing from an eclectic blend of rap, indie, and rock stylings, Post Malone is now one of the biggest artists in the world, and one of the go-to headlining acts for any major music festival. Nicki Minaj has stayed under the radar for a while, slowly building up the hype for her new album, Queen, which is set to be released later this month. Minaj was able to take the time out of her busy schedule to make a guest appearance on the new Kanye West album Ye, which was suddenly released just a few days ago. Diplo continues to be one of the most sought-after producers and DJ’s in the world, with plenty more collaborations coming down the pipeline the rest of this year. Diplo recently teamed up with mega-producer Mark Ronson to form the group Silk City, with the duo releasing their first collaboration recently. Diplo also recently released news of another collaboration with Sia and Labrinth in the form of supergroup LSD. And of course, he has been steadily releasing new music of his own as well. After taking a break to work on her acting career, Janelle Monáe is back with a vengeance this year, with the recently released Dirty Computer showcasing her innovative blend of hip-hop, funk, pop, and soul music. Monáe is currently gearing up for a summer tour of the country, which is set to start in a few days. UPDATE 8/7: It has been announced that additional acts have been added to the festival. This includes the likes of Daniel Caesar, Tekashi 6ix9ine, Pusha T, and Lil Skies who will be joining one of the most stacked lineups for a music festival in North America this year. UPDATE (8/13): The lineup for 2018’s Made in America Festival just keeps getting more stacked. Today, according to an Instagram post from the festival’s account, Los Angeles rap heavyweight Kendrick Lamar has been added to the bill.